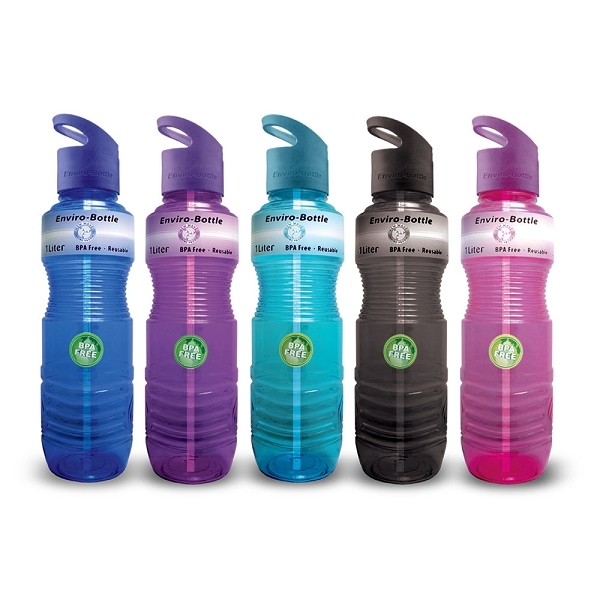 Enviro Products’ well-recognized design is available in 5 unique colors – one for each member of the family! Two full bottles per day equals your daily requirement of water. Perfect for your desk at the office, to take to a baseball game or for your post-workout re-hydration. Note: The band in the middle of the bottle is a removable paper label. Enviro Products’ well-recognized design is available in 5 unique colors – one for each member of the family! Two full bottles per day equals your daily requirement of water. Perfect for your desk at the office, to take to a baseball game or for your post-workout re-hydration. I bought one and used it for about a month then the straw part mustve broken because it would just make a noise but not draw from the bottle - a friend of mine saw mine and had bought one and did not have any problems - I bought two more and so far so good - no problems - for the price you cant beat it..i carry mine with me and drink water all day..